It’s the first Sunday of the month, which means it’s time to feature a student or up-and-coming illustrator. Today, Jessica Boehman visits, and I’ve actually wanted her to visit for a long while now, but … well, it gets busy in 7-Imp Land. I’m glad she’s finally here. Jessica also teaches art (and art history) in New York, but she talks more about that below. It’s a pleasure to feature her art today, which manages to be both fresh and timeless. Let’s get right to it, since she also tells us a bit about her work. Please note that you can see more of her art at her site, at Facebook, and on Instagram. I’ve come back to illustration after a first life as an art historian. The work on my Master’s and Ph.D. for Art History was so long and arduous that I swore that, once I earned my doctorate, I would get back to drawing and illustration, which had been my undergraduate major. That’s the adult version of that story, but the kid version is this: My mother taught us to love books. I have a big family, so illustrated books were in the house long after we had outgrown them, and we, in turn, read them to our younger siblings. So I grew up loving books, and I especially liked the idea of being able to draw in a sketchbook. All five of my siblings are creative types, so it felt natural when I was young to choose art. That seemed to be the Boehman way. Most of all, I was always telling stories. I still do. Those two loves merged in illustration. I’m very traditional: I do all of my work by hand, except for minor digital additions. I prefer the dry media, like pencils and colored pencils, for their layering capabilities, their rich color output, and for the control they offer. But this summer, I’ve been having fun playing around with ink or mixing ink with colored pencil and paint, and I think both india and acrylic inks will feature heavily in my new work. My full-time job is as an Assistant Professor at CUNY’s LaGuardia Community College in New York City, where I teach Art History and Studio Art. It’s a dream job for someone like me, as it satisfies both sides of me, and it allows me to work in the same town as my husband, Mike. My art history training (specifically in Renaissance and Baroque art) has taught me to read images very carefully and to try to imagine the world in which that artwork was produced, which makes it fun for me to try to imagine what it would be like to be inside of the world that my illustration creates. The period I study was very interested in close observation, so I suppose that, too, has translated into the detailed way that I make my own artwork. But lately, the actual act of teaching has been the most inspiring. Watching my students be brave enough to step outside of their comfort zones and to push themselves when I push them has given me the courage to try things I might not have before. Their boldness teaches me to see through fresh eyes. I take a lot of inspiration in roundabout ways from my cultural heritage. I’m half-German and half-Italian, and so I really connect with folk and fairy tales on a deep level. I love how they teach us to look for the magic hidden in everyday life. I try to add something of that unexpected wonder in all of my drawings. [My favorite illustrators are] the classics: N. C. Wyeth for mood color and exquisite composition; Maurice Sendak for the delicate power of his pen and for the raw honesty of his stories; Adrienne Adams for her lovely color, memorable characters, and creepy moods; and Trina Schart Hyman, because she made the world so romantic. Currently: everything Shaun Tan creates gives me the shivers. 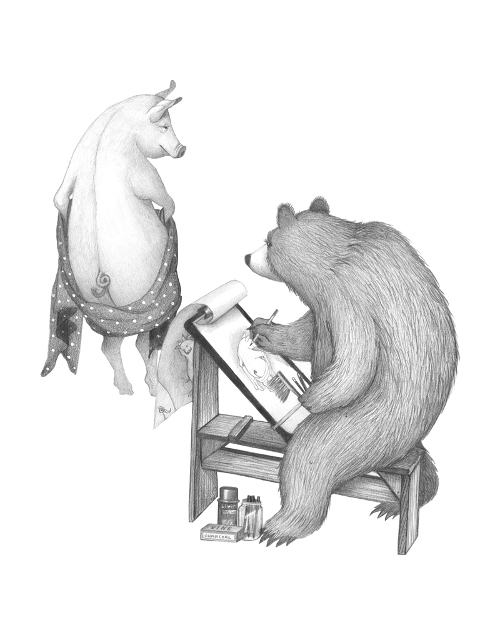 I’m in awe of the way this generation of women artists, like Isabelle Arsenault, Melissa Sweet, and Rovina Cai imagine their illustrated worlds. Lately, I’ve been looking just as much at comic book and graphic novel artists. Bill Watterson, the creator of Calvin and Hobbes, is the artist I use most frequently as an example in my classes. I remember drawing from his books when I was young, and I still study him now. His comic is a master class in illustration. Recently, I have been experimenting with some short comics, with wordless stories, and with writing my own short stories that will give me the freedom to work in a variety of styles and moods. The end goal for these is my first, upcoming solo illustration show. One of the short stories I’ve been working on is a fairy tale written by my author brother, Joshua Boehman. I’m also preparing some storyboards, based on my original stories, that will grow into dummies, one for a gross poem about a sandwich that I wrote for my nephews, another for a story about a little girl who enters a storytelling contest, inspired by a childhood memory. 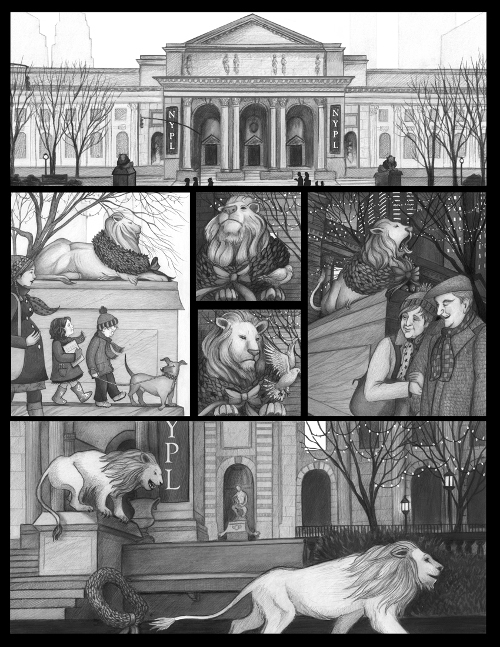 My hope is that my artwork will find a good home in some illustrated children’s or middle-grade books. Stay tuned for something completely different! I’m excited to see what comes next. All images used by permission of Jessica Boehman. 1) This poem by Carrie Newcomer. What does that remind you of, dear kickers? I should probably wait to share it next week, because we’ll have been kickin’ for 500 weeks then, but oh well. Won’t hurt to see it twice. 2) This new Oatmeal comic. 5) I’m going to the Boston area this week for work, and I’m going to make some stops and visit friends and children’s lit colleagues on my way in. 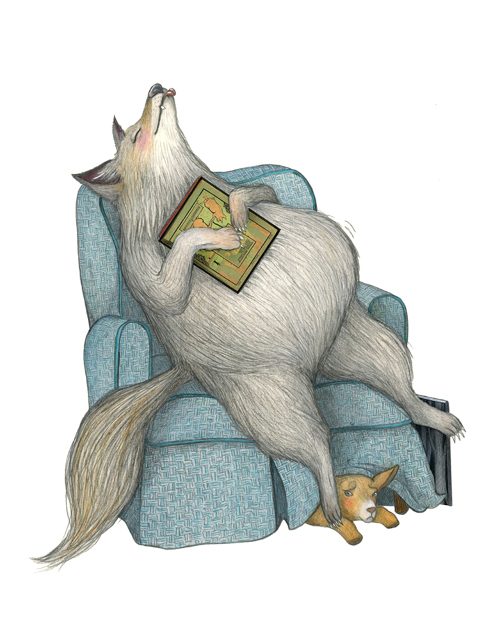 7) Speaking of YouTube, ALSC has posted the videos of Sophie Blackall’s Caldecott acceptance speech; Matt de la Peña’s Newbery speech; and Jerry Pinkney’s Wilder speech. They’re all here. BONUS: This illustration from Juana Medina (in response to this news item from this week). Thanks to Juana for permission to share that. BRING ON THE TACO TRUCKS. Happy Sunday morning to you! Oh my goodness I love Jessica’s work! Her use of light and shadow, her fine lines and details are exquisite. Her interpretation of fairy tales is full of their essence but also a subtle hint of humor. 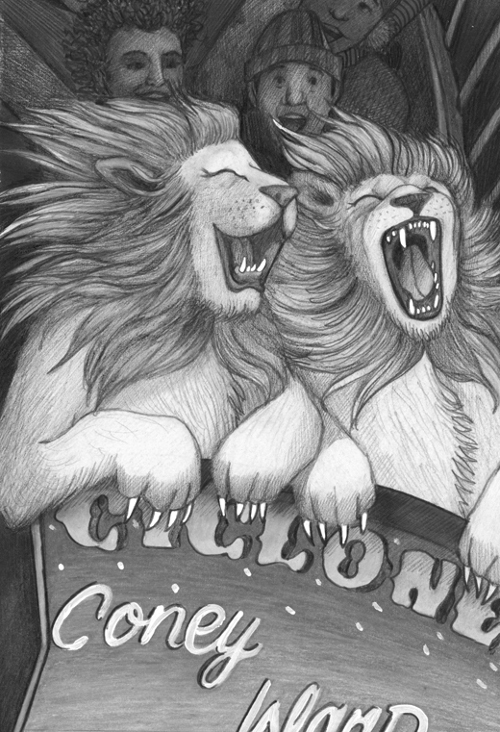 The two lions wordless comic is fabulous. I did not want it to end. Thank you for reminding me about the speeches on YouTube and for sharing the Juana Medina drawing Jules. 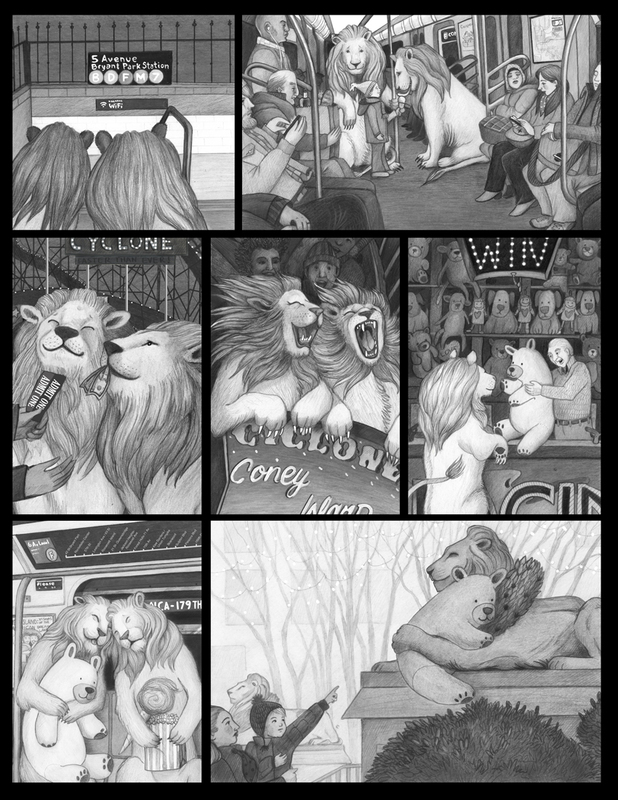 Love, love, love the comic with the Lions. Can you imagine? Thank you for introducing us to Jessica . Her colors and lines are the kind I could pour over for a long time. Thank you for Juana’s drawing. Am going to check out the speeches. Margie, I woke today to.the coolness of morning, fall is traveling here. 1. School started. We got a contract. Kids came Wednesday. 2. Realizing I have had 59 first days of school. 61 if you count nursery school. School is in my blood. 3. Visiting Tualatin Wildlife Refuge with a friend. 4. Fifth graders taking the lead in training students about walking in the hall. 7. Attending the state fair today. 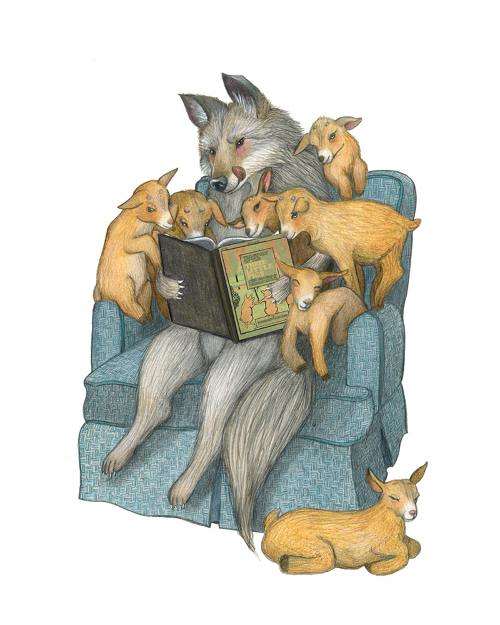 Delightful illustrations! Jessica’s work is just wonderful and now a new favorite. How lucky are we to have the opportunity to read about and SEE Jessica’s work! Thanks to you for these first Sunday of the month discoveries. She is definitely on my radar now. Margie: Those lucky children, to have you visit. Jone: The speeches are GREAT. I had read them earlier, but it’s always good to see the videos if you couldn’t be there. … I hope the school year goes well, Jone. Dow: Ooh, I want to see some wild sunflowers. What is your oldest studying? 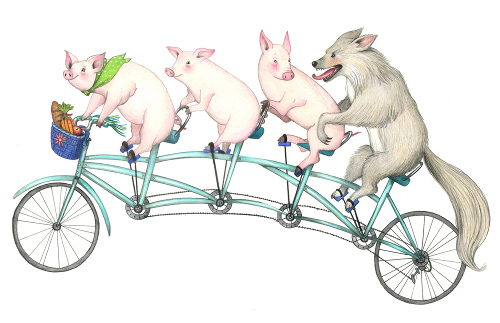 I love Jessica’s artwork–and the humor in some of her pieces! Coming to the Boston area? Wish I could meet up with you–but the grand girls keep me busy. 1) The expected bad weather we were supposed to get because of Hermine has not materialized. It is sunny and beautiful here today. 2) Finished working on curriculum extension activities for my book Things to Do. The marketing manager that I have been corresponding with loved them. That was a relief! 3) I bumped into a former teaching colleague (Adam) who worked in the classroom adjacent to mine. He was wonderful with his students. He told me he had recently married another teacher from the school. She’s a “super” teacher too. I am so happy for them. I had always hoped that they would get together. 4) I made plans to visit Adam’s classroom after my book is released next February to do a poetry writing lesson. I am looking forward to seeing lots of old friends who are still teaching at that school. 5) I am going to attempt making Mexican street corn today. I have never tasted it–but it sounds SOOOO yummy! 6) I got a rejection from a publisher recently–but the editors wrote the following in their email to me: “Lovely language, especially our favorite, Mother Duck. Does not fit our needs right now. Please keep us in mind for future projects.” I am planning to send the publisher another poetry collection–one that I just finished revising. 7) I’m planning on enjoying a day outside now that my respiratory infection is in its final stages. 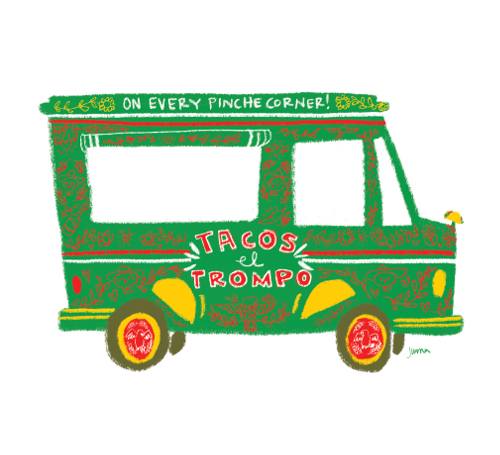 I wish we had taco trucks on every corner here! We have very few good Mexican restaurants around these parts. Maybe some day. I girl can wish. Elaine: I won’t even have one second to visit, sadly, so don’t feel bad about it. Plus, grandgirls are better than I. … That is, indeed, a lovely rejection letter. Keep on keepin’ on. Can’t wait to see your book! BUT we MUST meet another day, Elaine. Definitely. It *will* happen. I certainly hope it will! I would love to sit and visit with you some day. 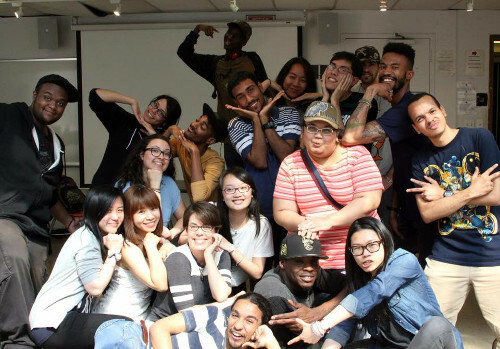 Jessica: Thanks for sharing your art and your stories with us. Yay for your mother encouraging your family to read and to be creative. 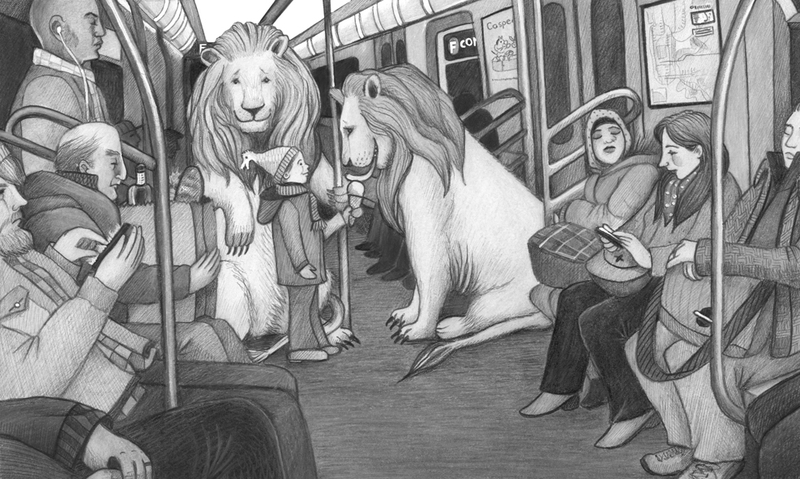 I really like the lions at Coney Island. That is precious. Jules: An attitude of gratitude. 🙂 Hi to Eisha and co! Have fun in Boston. Margie: Sunshine, blue skies, and full moon = lovely. Jone: Have fun at the fair! Dow: Sunflowers are so pretty. Elaine: Sending you healing thoughts. I’d love that too, Elaine. Little Willow, one day I WILL hear you sing in person! 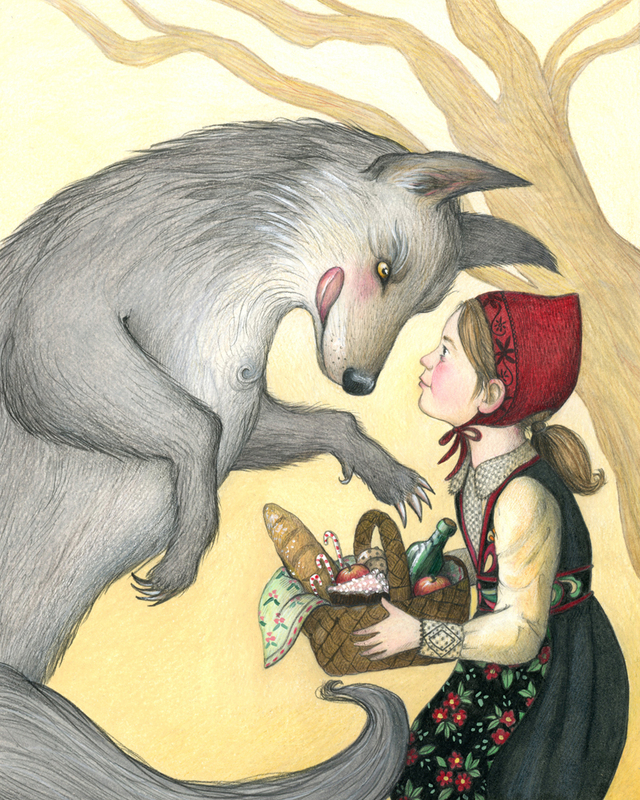 Oh wow – I love big bad wolf and little red, and the lions, such incredible detail and expression and humor. Thanks so much for sharing your work Jessica! Jules – The Offbeats cracked me up. I so love So I married An Axemurderer. And hooray for kind football players. And gratitude. Margie – sunshine, blue skies and dinner with friends sounds like a great week. Jone – have fun at the fair! Yum to bbq’ed salmon and wandering. Dow – sunflowers, hugs and excited 17 year olds are all awesome. Elaine – hooray for good weather and being on the mend. LW – congrats on the callback! And yay for rest, laughter and song. 1) Reading “The Lost Girls: Three Friends. Four Continents. One Unconventional Detour Around The World,” and getting inspired to make plans for much (much) shorter but still far-flung travel. 2) Sons of Anarchy – my new Netflix addiction. 3) Day trip to the beach for work. Rough life, I know. 5) The wedding of a good friend on a farm yesterday – beautiful setting and the weather held so it was mainly outdoors. 6) Flower girls in white lace dresses and cowboy boots. 7) Catching up with friends, Oregon Pinot Noir, fresh wood-fired pizza, chocolate doughnuts with pudding in the middle. Dancing with a two year old. 7.5) Home to snuggle Daisy. Thank you everyone for the lovely comments! It’s so exciting to be here. I appreciate all of your kind words! 4. Preparing for a new semester starting Tuesday! Jessica: Good luck with the new semester. I’m glad 7-Imp was a bucket-list item I could help you attain. Dow: Good luck to your daughter. Sometimes I think the major-declaring is overrated. Unless someone knows what they want to study, without a doubt (like, since childhood), sometimes indecision is good.